Open accounts in different browsers! Separate check and notification setting for each account! Check mail at a specified interval. Notification Center & sound notifications. Mail Notifr version 1.0 and above (require OS X 10.8+) is available only on Mac App Store as a paid app. Read the announcement. 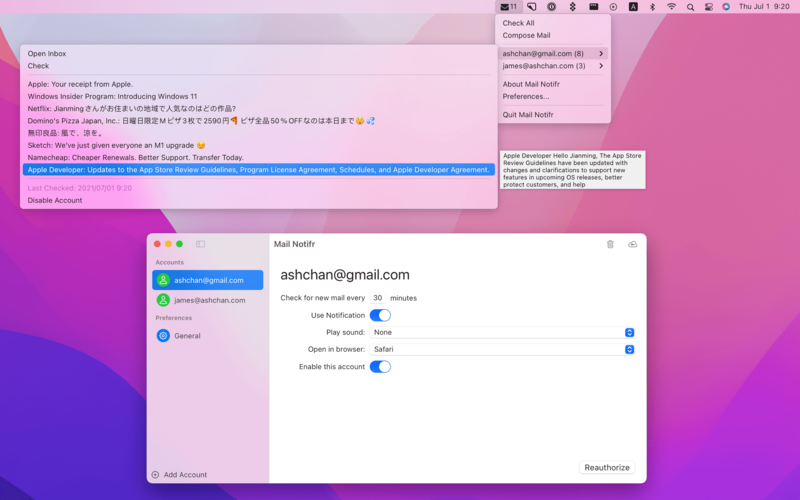 Gmail Notifr 0.9.0 is free (require OS X 10.7+). Download 0.9.0. How to set Mail Notifr as Mailto handler? In Mail.app - Preferences - General, select 'Mail Notifir.app' from 'Default email reader'. I don't want to buy, is there a free version? Yes! The free version is called Gmail Notifr (v0.9.0), which can be downloaded here. The free version will not have any updates in the future. You can either uncheck the 'Use Notification' checkbox under account detail settings, or disable or customize the notification from OS X's System Preferences - Notifications. I have 2-Step Verification enabled, can I still use Mail Notifr? Yeah! But you need an App password to access your Gmail feed, follow this guide to generate an App password then use that password in Mail Notifr. Is my password safe with Mail Notifr? Yes. Your password is store in OS X's Keychain securely. When Mail Notifr checks your new messages, it talks to Gmail feed using HTTPS. When I open a mail I want the count number to get updated. Change number 30.0 to seconds you want to delay before an extra check. The extra check will update your count number. Set the value to 0 to disable this feature. * Gmail™ is a trademark of Google Inc.